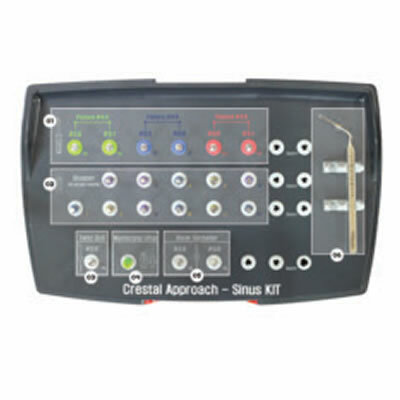 Crestal Approach Sinus KIT | Hiossen Inc.
Hiossen's Crestal Approach Sinus KIT (CAS-KIT) is specifi cally designed to easily and safely lift the membrane in the maxillary sinus from a crestal approach. The chief component of HIOSSEN's CASKIT is the CAS-Drill, which features a unique design to enhance the convenience and safety of maxillary sinus surgery. The atraumatic design of the drill tip allows the user to perform sinus surgery even if the sinus floor is flat, incline, or septum. It offers precise cutting, with a fl exible cutting speed, and the CASDrill tip forms a conical bone chip when drilling, which assists with safely lifting the membrane. The drill is designed with 4 blades that reduce defl ecting off of the bone, and the straight sides dampen vibrations. In addition, bone particles generated while drilling discharge upwards, producing a 'Membrane Auto-Lift function,' according to HIOSSEN. Dental Product Shopper enlisted the help of 8 dentists who currently own and use the CAS-KIT in their practices. They rated and commented on the kit's safety and convenience, providing feedback on the enhanced safety and convenience features touted by the manufacturer. The CAS-KIT aids the dentist in providing a safe sinus lift through a combination of its specially designed drill and stopper system. The clinician is able to easily perform the procedure, without the fear of over-drilling. From the flexible cutting speed, to the Bone Carrier System, the CAS-KIT has a number of features that make it simpler for the clinician to perform a sinus lift procedure. The evaluators were asked to rate the convenience of the CAS-KIT compared to the Lateral Window technique, with 6 rating it excellent, and 2 rating it very good.When scoring the effectiveness of the CAS-KIT compared to osteotome, 6 rated it excellent, and 2 rated it very good. All 8 evaluators rated their overall satisfaction with the CAS-KIT as excellent, and all said they would recommend the kit to their colleagues in the dental profession.